There are a lot of important events in Labour history that get overlooked. The Coal Miners strike in 1948 in France is one of them. I have tried for days to find information on this event and so far all I've found is a short interview on Radio Fours History Hour, some archival footage from Pathe with no commentary just a few minutes of film reel recording random events during the strike and one article by a French Trotskyist organisation written at the time and translated into English at a later date. I'm assuming there's more information in French, but even with my limited French I wasn't get many results and couldn't read what I found. The Trotskyist article is interesting but unfortunately the authors were motivated by a naked desire to discredit the French Communist Party (PCF) and cast themselves as its replacement, rather than recount the events of the strike accurately for the benefit of all. And since its the only source I've found I can't tell how accurate the information it does provide is. Indeed it seems to contradict the miner being interviewed, in the BBC documentary on some important points. I have found two other sources, however one is hidden behind a pay wall and the other has only translated a brief abstract, the rest of the article is in French, so no help there. In frustration and a desire to make things a little easier for other searchers I've made a video by splicing some of the Pathe footage together with the part of the History hour on the strike. I'm hoping that by making this blog other users and readers of this site will know of some more in depth articles and histories of the strike and this period such as the strike wave of 1947. A French user shared this(http://www.cinearchives.org/Catalogue_d_exploitation_GRANDE_LUTTE_DES_MINEURS__LA_-494-149-0-2.html?ref=f67ef3b524e29b901703fa543c97d706) an eleven minute account of the strike including more footage and commentary, worth watching if you understand French. Hello and welcome to the History Hour podcast from the BBC World Service with me Max Pearson. The past brought to life by those who were there. The years immediately after the Second World War were characterised by huge changes, and evolving sometimes hardening attitudes. The tectonic plates of competing ideologies were shifting; an Iron Curtain between East and West appeared. In the midst of these global tensions individuals and groups of people could find their lives turned upside down by powerful forces beyond their control. That’s what happened to one group of key workers in France in 1948. They were coal miners who found their wages and conditions cut in the post war austerity and they went on strike. But as this report from Lisa Louis reveals they were crushed by a government fearing the influence of creeping Communism. We had become the pariahs of the Republic, they were regarding us as terrorists, although the government was actually terrorising us. Norbert Gilmez was one of the strikers at the pit in Bulli Limine (not clear transcriber note) in Northern France. Now 95 and still living locally, he remembers how until the strike coal miners were considered hero’s helping France struggle back onto its feet after the devastation of the Second World War. These Miners are giving their all. In 1919 it took five years to make up for the losses after the war, in 1945 it only takes two years. 90% of French industry was running on coal, the miner was the country’s most popular worker. He was celebrated and seen as a Patriot, those of us who were working down the mines were badly equipped, we just had cloth shoes with holes in them and pickaxes to dig with. But we were enthusiastic about our job, we rolled up our sleeves and got to work, to give the country back its coal. But the Miners enthusiasm soon soured. In 1948 the government started to strip away what they considered to be well earned rights. Their minimum wage was abolished, slashing their pay up to 80%. A second controversial measure concerned occupational diseases. The strike started with a ballot, it was very democratic, 94% of us took part, 90% voted in favour. It was an all out strike. However the government was determined not to give in. it sent riot police and the army to confront the miners. As the French coal strike enters its fourth week and industries become crippled by lack of coal, troops and police take over pits in the northern basin. The riot police kept beating us, many of us were arrested, often at home ad sent to the prison of Béthune. They mainly arrested Union members, six strikers were killed, the police were ruthless. Gilmez helped organise the walkout at his mine, as an office worker he arranged for the distribution of clothes to the miner’s families and to have their children evacuated to other places for safety. As a punishment, the authorities targeted Gilmez’s family. While I was away they searched our house, my wife was on her own with our son. She was pregnant, they pushed her against the wall and grabbed her by the throat. They said we will kill your husband if we catch him, she was terrified. Faced with this overwhelming force the miners lost. By the end of November all industrial action was over, 3,000 strikers were arrested nationwide, many received prison sentences even though it was not illegal to strike. Gilmez was convicted for “impeding the proper functioning of the mines”. I was sentenced for something that was technically impossible, they said two colleagues and I had told some railway workers to bring a coal train back into the mine instead of taking it to the coking plant. Its true that the rail workers had asked us for advice, but we said we didn’t have the power to tell them what to do. You know that verdict just didn’t make sense. Gilmez spent fifteen days in prison, and he was sacked just like the other 3,000 arrested strikers. But that wasn’t the end of the state’s revenge, after their release the miner’s found themselves blacklisted. We were searching for work everywhere, however it was really difficult. I finally got a job as a road worker, but only half an hour after I’d started work they came up to me and said the mining corporation doesn’t want us to employ you, you have to go. All the private companies in the region were dependent on the state owned mines, it was like a state within a state in France. Gilmez finally found work as a journalist on a Communist newspaper. It meant a daily commute by bus of several hours. His sacked former colleagues were facing a similar situation, they struggled to find jobs and most of them eventually had to move far away to make a living. Even many of those who kept their jobs faced retribution. My Comrade Leon Leclees had the incurable lung disease silicosis, but when he was diagnosed the Doctors told him to work above ground, then after the strike the bosses sent him back underground where he would breathe in that poisonous dust. Little by little he could feel himself dying. For me this was torture and state terrorism. But why was the French government so intent on punishing the mining communities? After World War Two the tensions between the Soviet Union and the West had begun almost immediately. In 1947 the Communists had been forced out of France’s coalition government, in 1948 Soviet backed Communists had staged a coup in what was then Czechoslovakia. Most of the French miners were Communists, for Jules Moch the Interior Minister at the time the Union leadership was pursuing a hidden agenda. The miners themselves are fighting for better working conditions and higher salaries. But the Communist party intends to get back into power, the leaders of the strike want to reproduce what happened in Prague just a few months ago. They want to stage a coup. Gilmez himself was and still is a Communist, but he denies that there was a Communist plot. the government has invented this myth, it was never our plan to stage a revolution. The only issues in the ballot for the strike were our demands to keep our rights. Let me give you an example; at one point we managed to turn the tables and capture 200 riot police. You know what we did with their weapons? We destroyed them and threw them in the river. Do you really think we would have done that if we had been planning a revolution? But it was the beginning of the Cold War, can you understand that the government might fear a Communist plot was behind the strike? I do understand what you mean, but you know there is a saying in French `when someone wants to kill his dog, he will say the dog is blind`. If you want to crackdown on people, you will find a reason. There had been another strike in 1947, when the miners were asking for more meat and bread. The government had given in, that’s why they felt that in 1948 they had to crack down on the miners. The French government has gone some way to acknowledging that the miners were treated unjustly. Sixteen of them received €30,000 each as compensation for their unfair dismissal. In September 2016 President Francois Hollande honoured several miners who had lost their military grades as a consequence of the strike. There are causes which are worth a lot of effort even if they happened a long time ago, and now only a few people are still concerned by this. Making up for one injustice is like setting the world in order. But GIlmez says its not nearly enough. Almost seventy years on his fury hasn’t dimmed. He says the government destroyed the strikers lives and should reimburse them for their lost careers. I think everybody should have the right to live happily, and I still believe in justice. If the government doesn’t pay me and my wife, then my children can continue the fight. France’s last coal mine closed in 2004. All the private companies in the region were dependent on the state owned mines, it was like a state within a state in France. This looks like a really good start. Did you find http://archive.spectator.co.uk/article/3rd-december-1948/8/the-french-coal-strike already? I've been meaning to read more about the Renault strikes in 1947, they're mentioned briefly by Dauve and Socialism ou Barbarie (google Renault 1947 libcom) but couldn't find anything good specifically on them. http://libcom.org/library/occupation-factories-paris-1936-flint-1937 has detail on Renault strikes in '36 which must have influenced the 1947 ones. I haven't read around either of these, but they've been on my list for a while. This covers 1945-47, where there were massive strikes at Japanese coal companies, as well as 'production control' where workers occupied their firms and ran them directly. On top of that, Brecher on the post-war strike wave in the US: https://libcom.org/history/world-war-ii-post-war-strike-wave, and the Saigon Commune https://libcom.org/history/articles/saigon-commune-1945 - probably British dockers 1945-1950 too against Labour government. I think there's enough of these instances to recognise them as part of an international wave of post-war strikes and uprisings in the same way that people talk about 1917-18 (and 1865-1877, 1968-69) except that 1945-50 hasn't had nearly the same attention, so it would be good to expand on things a bit. Just added http://libcom.org/library/coal-miners-general-strike-1949-50-birth-marxist-humanism-us to the library with that in mind. Thank you for the information, especially the Spectator article. I made this a blog post in part from frustration with something I keep running into while looking for history articles. I'll find a reference to an event usually a strike or wave of strikes, with just enough information to convince me that it seems important, and yet I can at best confirm that it happened and come across twelve different sources that briefly mention it. This seems especially bad if its a miners strike thanks to the importance and fame of the UK miners strike in 84-85. I just hope I can help popularise what little I've found on it. 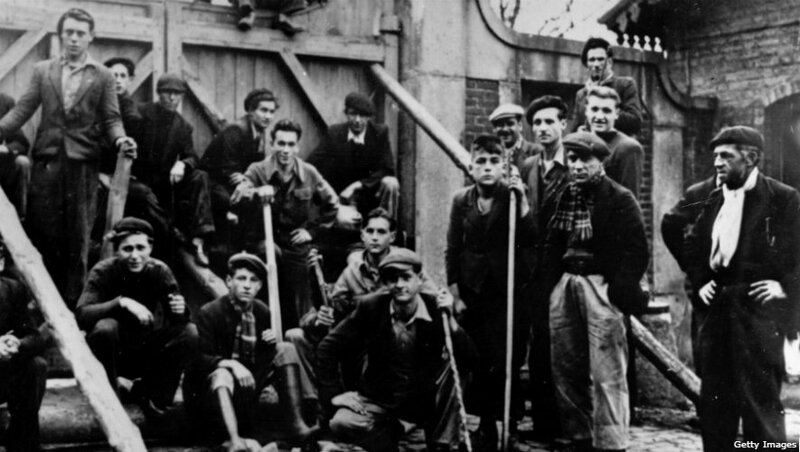 I typed up a transcript, couldn't make out the name of the pit Bulli Limine was the closest I could get, but I did just find and order an English translation of CGT pamphlet about the strike called The Truth About the 1948 Coal Miners Strike. There weren't many details about the content but hopefully it should provide some information.